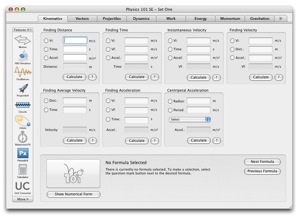 The Physics Calculation Software of Choice for Students and Teachers for Mac OS. The perfect solution for physics students and teachers everywhere, Physics 101 SE For Mac is software caluation solution that allows you to focus on physics and not mathematical busywork -- giving you correct answers and fast! With its ability to instantly solve for almost any variable in over 150+ of the most commonly used physics formulas, you'll be able to quickly and accurately complete physics assignments like never before. Just select the formula you need, enter values like distance and time, then click "calculate." With Physics 101 SE for Mac, it's that simple, every time. And when you move onto more difficult subjects in physics, such as resistor circuits, kinematic motion analysis, projectile mathematics, relativity and so on, Physics 101 SE For Mac becomes even more valuable. Great dolphin game! Leap out of the water and do crazy tricks. Qweas is providing links to Physics 101 SE For Mac 7.2 as a courtesy, and makes no representations regarding Physics 101 SE For Mac or any other applications or any information related thereto. Any questions, complaints or claims regarding this application Physics 101 SE For Mac 7.2 must be directed to the appropriate software vendor. You may click the publisher link of Physics 101 SE For Mac on the top of this page to get more details about the vendor.